It was a warm summer day in downtown Los Angeles when at six-years-old I finally decided it was time for an answer to that bit of reality that had confronted me every day of my short life. My mother stopped in her tracks, turned to me and took the opportunity that morning to explain to me that God created diversity and that we, as Black people, were in the minority. It didn’t take much beyond that to satisfy my curiosity at that age, but clearly her taking the time to patiently explain things to me at that moment had a lasting impact. My mother took advantage of a teachable moment and engaged with me on a sensitive topic in a thoughtful and direct manner. This series of articles uses the term “race” as it is commonly understood today. However, defining race is difficult to do. Even the United States Census Bureau describes race as “self-identification data items in which residents choose the race or races with which they most closely identify.” Historically, people were generally described by where they were from or their social class or religion. The Bible uses this approach, describing people groups by region or other characteristics, such as Hittite, Roman, Ethiopian, Noble, Centurion, Gentile or Egyptian, rather than race. The concept of race based on skin color and other physical features is a relatively new paradigm, becoming popular among American scientists and sociologists in the 1600’s seeking a way to label “Blacks” as less than human in order to justify slavery. Today, scientists conclude there are no physical features or combination of features that can accurately define any “race,” and our physical features are superficial and only skin-deepRACE: The Power of An Illusion – Episode 2 https://www.youtube.com/watch?v=NGLsn8O_Lvk. Therefore, it is with this complex background in mind that this series of articles on discussing race with teenagers and children will largely stick to the contemporary understanding of race and racial descriptions. Ask any parent and they will tell you that “little pitchers have big ears.” Children see and hear much of what is going on in the world around them, even if they do not always let you know what they have seen or heard, and what they are thinking. Recently, the issues of race, racism, and race relations has become a regular visitor to the front page of most newspapers, the leading story in many television news broadcasts, and the subject of conversation around the water cooler and even the swing set on the playground. Even if your children have never asked you about race directly, the prevalence of race-based issues in the news and conversation presents an opportunity to open the discussion by inviting them to talk about the obvious differences they see between themselves and others at school or in the community. . The youngest children can be taught that God created all people of every race, and the Bible says He loves us all. God loves us regardless of the size of our noses, the smoothness of our skin, or the texture of our hair. Just as you loved your children before you saw what they looked like, and you love them despite any physical changes they experience, God loves every person in His creation. It does not matter how we look on the outside. Remind your children also that we are commanded to treat everyone with love and respect ― even our enemies. Talking to your kids about race presents a unique opportunity to shape their perspective and how they will interact with the people they meet for the rest of their lives. It does not have to be a lecture. Generally conversations about race and racial issues can flow in a very natural and conversational manner. Don’t Punish Young Children For Inappropriate Remarks: There may be times when a young child may make an inappropriate comment regarding race. Rather than responding in anger, that is a good time to gently correct their misunderstanding and teach them a better way. As A Family, Research A Culture Different From Your Own: Discover how different cultures celebrate Christmas or birthdays and point out that it isn’t a person’s skin color that makes them say certain things or act a certain way – that is tradition and culture. 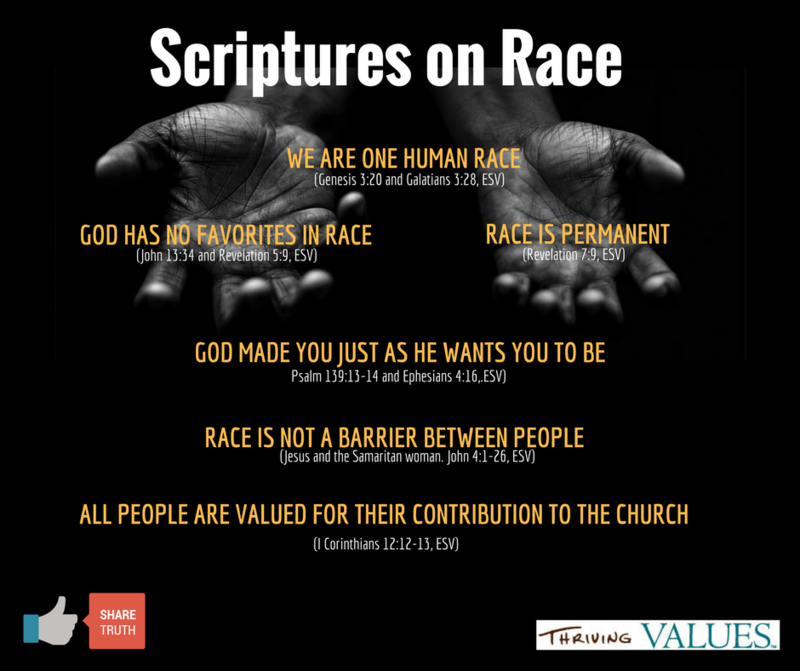 Use The Bible As A Reference Point: Below is a list of verses relating to race and kindness toward one another despite outward differences.